In Dolltown, friendship is important. Dolltown began because we decided to acquire friends for our vintage singletons! I figured that all our dolls ought to have friends. So as the Dolltown characters started to arrive, they each naturally paired up with like minded others, or others in the same scale. And we have lots of friendships now in Dolltown! But we recently had a shake up with the Little Darling BFF's. Isn't that just like little girls! Things just weren't working with some of the pairs. Something had to be done. And that meant I had to figure out what was wrong...take a step back and see what was causing it. I realized something that had contributed to the friendship incongruencies...I set up most of the friendships before the actual dolls arrived. 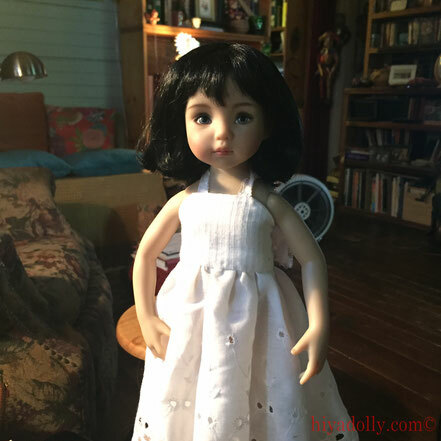 Several of our dolls were ordered from artists. And while we waited for them to come, I used their model photos to pair up them up. And when the they actually arrived in Dolltown, they buddied up. It makes it easier to keep track of things. Dolls really do have characters, that show up especially in their faces. If the eyebrows are straight, or curved, if the eyes have a direct look, or a soft look...it makes a difference in who they are. What they say. And we had a couple of dolls who were showing a different character than their photos. And they needed different BFF's! So, without showing all the changes, I'll talk about three. Birdy's buddy was Rosa, Evie was hooked up with Conner, and of course, Lula and Scout were BFF's. But, although I love Conner's black flip hair and her fabulous blue eyes, I just kept switching her up, trying to get her right. Her character was not jiving with Evie, who is quite a tomboy, and very active. Without their wigs, Conner has a soft, sweet look, with rounded eyebrows, and Rosa has a more intense look, with her big green eyes. Lula is now hanging with Evie, both outdoorsy. Rosa is cooking up serious stuff with Scout, both on a mission! 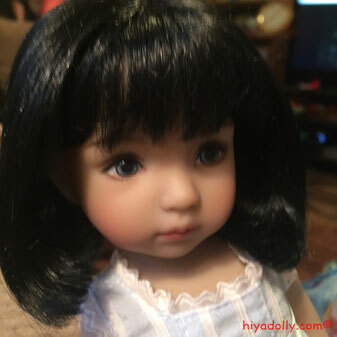 And Conner...we have tentatively switched her to a soft brown jojo wig and the name Coco. And she is buddying up with Birdy. Coco will make her appearance for our beach photo story. And Conner will be "going on assignment". We'll see how it goes. Maybe Coco will just be visiting for now, just in case the change is not permanent. But so cute! Definitely like a new doll when they get switched up like this. It's really interesting how a change of hair gives a totally different look to the same doll. I think the hairstyle on Coco works a bit better than Conner. And yes, it's so true how each doll has their own personality. I don't know who will be friends with who in my house after they arrive. We know that friendships evolve, so it will be interesting to see the new pairings in Dolltown! Do you find you take photos with certain pairs because of how they "go together"? It may be a little like styling a fashion shoot? Choosing pairs, or trios, for effect. I don't have so much the problem of needing to style pairs in terms of personalities. But sometimes when I choose certain girls for a shoot and not their friend, I have issues with long faces! If my girls had the idea that they could get more modeling bookings by wearing different wigs, I'd have a pretty big bill coming from Monique's wig shop! As it is, I had to put up with everybody begging for upgraded bodies. If you let them, these dolls will run you ragged (she says as she looks at the holes in her slippers). Hahaha. You need little elves to dress you, while YOU sew for your dolls. I noticed how temperamental your girls can be, as well as beautiful and charming...what a balancing act for you! And every new doll adds a new dynamic. Didn't you add one recently?